FGC BOLSA - FGC FINANCIAL MARKETS INFO: Markets | U.S. Natural-Gas Market Takes Cues From China. Markets | U.S. Natural-Gas Market Takes Cues From China. Hello. Amrith Ramkumar with you breaking down the latest markets news after stocks edged higher Wednesday. Futures are up. We'll get data on producer prices this morning, with investors still weighing yesterday afternoon's Fed minutes that showed officials don't see the need to change interest rates this year. Before we see if the S&P 500 can start a new winning streak, our Ryan Dezember explains why overseas factors are increasingly impacting the U.S. natural-gas market. Global stocks mostly reversed early losses to post small gains a day after fresh signs of patience from the Fed and the European Central Bank. Lower prices in Asia and Europe could also hurt some U.S. companies. The rise of the U.S. as a major exporter of liquefied natural gas has helped balance the domestic market amid surging production. It has also linked the price of gas in Louisiana to the weather in China—a development that is increasing pressure on already low U.S. prices. The U.S. market, long isolated from global trade, has relied on domestic supply and demand for the heating and power-generation fuel to set prices. Now, though, enough liquefied natural gas, or LNG, is being shipped overseas that forecasting prices is becoming more complex. There are smog-battling policymakers in Beijing to consider, as well as nuclear power plant maintenance schedules in Japan and a host of other factors. 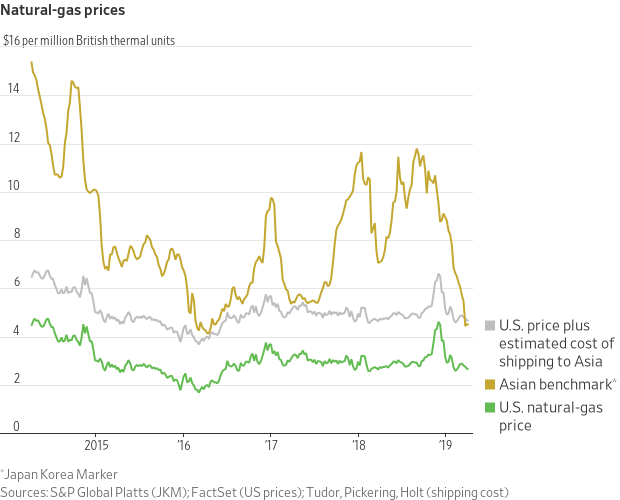 Lately a sharp decline in Asian and European LNG prices is reverberating back to the U.S. market. The Japan Korea Marker, an Asian price benchmark, has fallen below $5 per million British thermal units, down from more than $10 before winter. Asian prices have plunged in response to a warmer-than-expected winter in China and neighboring importers, which resulted in gas that was stockpiled in autumn being available for spring. At less than $5, the Asia price is right around the cost of U.S. gas plus processing and shipping expenses. U.S. natural-gas futures settled at $2.70 per million British thermal units Wednesday. Although processing and shipping costs can vary by exporter and destination, $2 per million British thermal units is typical, analysts say. This all has the potential to weigh on already depressed U.S. prices this year. LNG export terminals scheduled to come online this year are expected to sop up about half of U.S. production growth. If prices are depressed in major overseas markets, some say exporters may delay plans to start liquefying gas. The Russell 2000 index of small-cap stocks fell back below its 200-day moving average on Tuesday after briefly creeping above the long-term trend line for the third time this year. An index sustaining a rally above that line is seen as a bullish signal to market technicians. The index climbed back above the line with a 1.4% advance Wednesday. The MSCI Emerging Markets index rose for a 10th consecutive session Wednesday, its longest winning streak since January 2018, according to Dow Jones Market Data. An 11th straight advance today would mark its longest streak since April 2004. Coal exports from the East Coast sold for $46.12 a metric ton on Tuesday, down 26% in a month, according to S&P Global Platts. Coal prices have fallen amid slumping demand for the commodity, the world’s top source of electricity. U.S. producer prices for March are expected to rise 0.3% from the prior month. Excluding food and energy, the forecast is for a 0.2% increase. The figures are slated for 8:30 a.m. ET. U.S. jobless claims, also out at 8:30 a.m., are expected to rise to 210,000 from 202,000 a week earlier. International Monetary Fund Managing Director Christine Lagarde kicks IMF/World Bank spring meetings into high gear with a press conference at 9:30 a.m.
Fed Vice Chairman Richard Clarida speaks on the economic outlook and monetary policy at 9:30 a.m., the New York Fed’s John Williams speaks at an Association for Neighborhood and Housing Development conference at 9:35 a.m., the St. Louis Fed’s James Bullard speaks on the economy and monetary policy at 9:40 a.m., the Minneapolis Fed's Neel Kashkari holds a Q&A on Twitter at 2 p.m., and governor Michelle Bowman speaks on community banking at 4:00 p.m. The WSJ’s survey of economists is out at 10 a.m. Natural-gas inventories are expected to have risen by 29 billion cubic feet last week, a larger-than-normal addition for this time of year, according to the average forecast of 12 analysts and traders surveyed by the Journal. 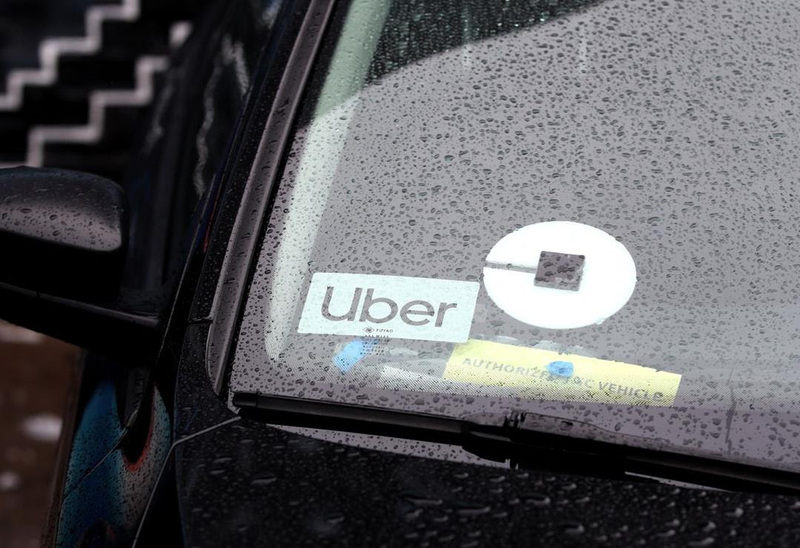 The figures are scheduled for 10:30 a.m.
Uber is aiming for an IPO value of $100 billion, below expectations. Lead underwriters had previously pitched a valuation as high as $120 billion, but the lower target came after competitor Lyft stumbled in its early days of trading. Big-bank chiefs and Democrats sparred at a House hearing. The chief executives at seven of the largest U.S. banks faced adversarial questioning from House Democrats on Wednesday, as lawmakers evaluated changes in the industry since the financial crisis. The long bull market has failed to fix public pensions. Robust gains from the longest bull market in U.S. history have failed to solve the deep-seated problems of the nation’s public pensions. But there is a simple reason why pensions are in such rough shape. Chinese inflation picked up. Consumer and producer prices were lifted by costlier pork and oil prices, another sign that growth in the world’s second largest economy may be stabilizing. Meanwhile, U.S. inflation stayed tame in March. The U.S. is pressuring a Russia-linked firm to sell its stake in a cybersecurity company. U.S. national security officials told a private-equity firm partly backed by a Russian billionaire named in the Steele dossier to sell its stake in cybersecurity firm Cofense. Yellen offered a warning to Trump’s central bank picks. Former Federal Reserve Chairwoman Janet Yellen sent an indirect warning to two potential Trump central bank picks, saying if they want to be relevant, they will need to check their politics at the door before entering the institution. Lyft: The ride-hailing company said it will release quarterly results on May 7. Shares tumbled 11% Wednesday, their second dip of at least 10% since the company went public late last month. Costco: The wholesale retailer said net sales grew 7.4% from a year earlier during the five-week period ended April 7. Bed Bath & Beyond: The retailer gave upbeat profit targets for the current fiscal year, though same-store sales fell more than expected in the company’s latest quarter. Facebook: The social-media company announced new changes to manage problematic content late in Wednesday’s session.